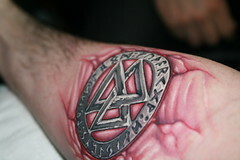 So, this time he did a similar piece on my right forearm. It's another piece of metal brutally embedded in my flesh. The symbol is a valknot (also spelled valknut) surrounded by the elder futhark (aka the norse runic alphabet). Altogether, it's a symbol for knowledge and power. Let's see if it helps any. So, that was Sunday during the day. Rewind to the beginning of the trip. Thursday night, we got our room at Hotel Pennsylvania (yelped) and had sushi at a great little place called Avenue A Sushi at like, 2am or somesuch. I recommend it for the decent food, great atmosphere and excellent hours. Friday, we had lunch at Tir Na Nog and went to see Grindhouse. (Unfortunately, we had to leave a little half way through the second movie, so no official review from me. If you want opinions, then ping me.) From there, we met up with some KaTG show regulars and went to Keith and Chemda's to witness the live show and play some poker. (Well, Annette played poker. I took care of a drunken, but very sweet, girl. Still, fun night and maybe the most relaxing of the trip.) I think we got in around 07:00. Saturday, I slept in. Way in. I think weeks of stress, and a night of drinking, caught up with me. But, since we had no plans to do anything touristy, there was no real need to be active before the afternoon. We went out for dinner at Wolfgang's. Hrm, what to say about Wolfgang's, what was it - oh yes. Holy crap, that's good steak. Then, instead of turning in early like I should have, we headed out to a party in Jersey. Ah well, sometimes you can't help being in an Irish pub one minute for after dinner drinks, and then across the water in Jersey at a party the very next minute. It's a really easy mistake. So, Sunday I was very hungover and very tired. It took a fair amount of willpower to get moving and make it to Last Rites to get my tattoo. Last Rites is in a new location now and it's half tattoo shop, half gallery. It's really quite impressive. Good place to get inked. We were subjected to much less death-metal, this time around. Something for which the girl was thankful. Sunday evening, we went to see Keith Malley perform stand-up, which was hysterical. Brother Love, closed out the night with a fairly short set. (HORRID audio quality, but a fun show still.) Closed the night out at Nice Guy Eddie's. So, yeah.. to sum up: My arm hurts and I am in desperate need of a vacation.